With the summer now here and the hope that the sun will be shining for a few months, we want our outdoor living space to be a great family hub to spend the long summer evenings. Gardening and landscaping can be expensive and some of our outdoor spaces are not very big, or child friendly. At this time of year, lots of us use our yard as an extension of our home, and just because it’s outside, doesn’t mean it can’t be a space to be proud of. Here are BubbleBum Travel Car Booster Seat’s top tips to create the perfect family outdoor space on a budget! Kids of all ages will love these six kids outdoor garden ideasa. Paint it black! If you have a wall it is perfect for a large blackboard, all you need is some blackboard paint and chalk! This will create hours of fun; and better yet it’s easy, inexpensive and clean! Add a little magic to your yard with a Fairy Garden. This is a lovely way to introduce your children to gardening. You will need a planter (plastic or wooden), some soil and then all the little bits and pieces to make the fairy garden special. You can plant some flowers and shrubs in the planter, to add a little colour and magic to your fairy garden. You will need some stones, a little house or a fairy door; let your children be creative with what they put in their fairy garden, fish tank accessories are perfect for this as they are miniature, waterproof and inexpensive. You can get these at any pet store or on Amazon. Embrace the mud with a Mud Kitchen, this is one of BubbleBum’s Favourite outdoor ideas for children. If can be as little or as big as your garden allows. You can use all your old pots and pans or pick some up from your local refuge or thrift shop. An old bookcase propped on some stones will make an excellent and attractive mud kitchen. This does not need to be complicated, because all that your kids want to do is have fun making a mud pie! A basin for water is helpful and it is also a good idea to have old baking trays, pots, pans and kitchen utensils. Brightly-coloured painted stones will make perfect mud kitchen food for playing and old camping equipment and cutlery are a great addition to the kitchen. A wheely amazing sand pit – all you need is an old tyre! Place the tyre on the ground and line the base with a waterproof sheet, you can get these at most gardening stores. Then fill the inside of the tyre with sand, your child will love this and can play with their diggers in the sand or make sand castles in the sun. A seating area and stage-this is a super fun idea for kids, all you need is some wooden palettes, colourful paint, blankets and cushions! Everyone including your kids needs a space to chill out and soak up the sunshine. Paint the wooden palettes your favourite bright colours and get some old blankets and cushions from your local charity shop. Stack the pallets to make a seating area and scatter the blankets and cushions. Make a stage for your children to perform by stacking some palettes on top of each other carefully. A music wall will keep all the family entertained. This is where the old pots and pans come in handy again. You should also visit your local building yard and get some metal chains and metal tins or some metal tubes. These can be secured to a bit of wood that can be mounted to the wall. Let your children’s musical talent and creativity flow having fun with their metal musical wall! The finishing touches…..to make your child-friendly outdoor space extra special, hang outdoor fairy lights around your new outdoor additions. 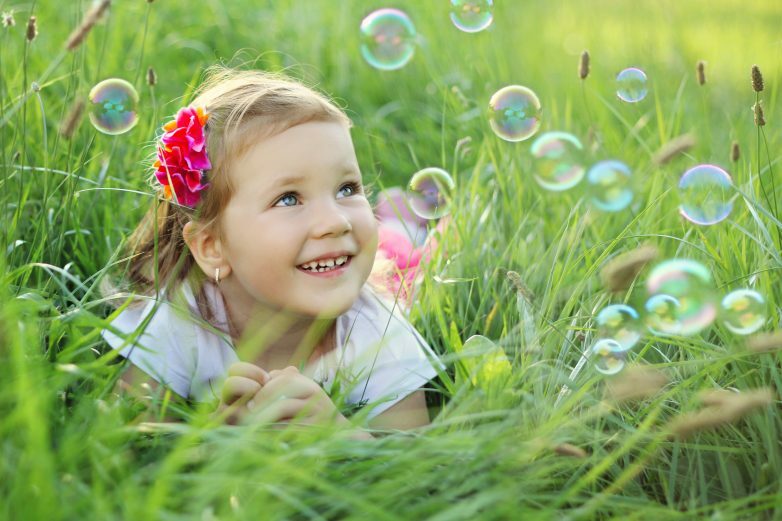 Get a bubble machine and have lovely bubbles floating through the air as your little’s play and if you have a concrete or paved garden buy a cool faux grass mat where your little’s can sit and eat their sandwiches. Perfect now all we need is some sunshine!